If you don’t know what Rasgullas are, then let me add to your knowledge, it’s cheese balls! I’m not kidding. 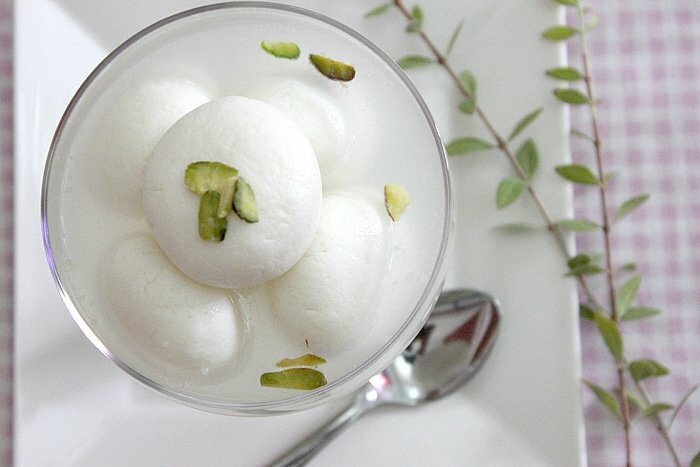 These Rasgullas are made from Paneer, which is actually Ricotta Cheese. When I was a kid, I used to think that this dessert is made from egg whites, since it’s so white. Making dessert out of cheese is fun. 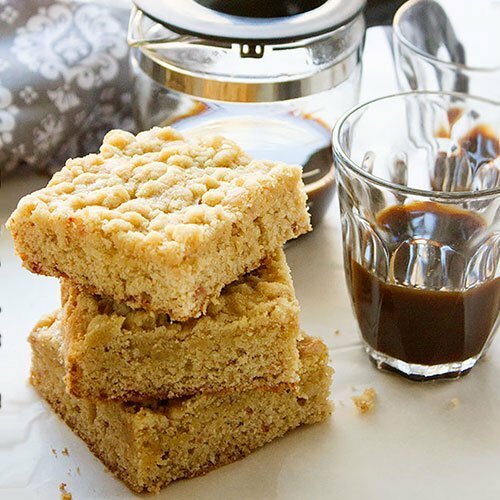 I wasn’t fond of this Indian dessert since it was very very sweet and heavy, but then I had a homemade version of it and was amazed how the taste was so different than store bought. Making this dessert is easy, but just like some dishes there are few things you have to keep in mind and do to get the best result. I know that some are frustrated because their Rasgullas break, don’t increase in size, and become hard when they’re suppose to be spongy. Well, I’m no different, I had my share of failed attempts when making this dessert, but with practice they turned perfect. In a medium saucepan, bring milk to a boil, stirring occasionally so the milk doesn't burn or stick to the bottom of the saucepan. Mix the lemon juice with water. When the milk comes to a boil, add the lemon water mixture and stir gently until the whey clears and the milk totally curdles. Pour the curdled milk, in a muslin cloth. Pour cold water on the curdled milk to get rid of lemon's smell and taste. Squeeze the muslin clothes taking out excess water. 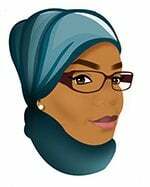 Either hang the muslin clothes for 30 minutes to get rid of extra water, or place the muslin cloth in a plate and place a heavy plate or object on top of it for 30 minutes. The paneer is ready and should be crumbly in texture. Knead it until you get a texture of smooth dough. Knead for 7-10 minutes. Make equal sized balls, remember that the rasgullas will double in size when cooked. In a medium saucepan, add all the ingredients and let it boil for 3 minutes. Reduce heat to medium and add the rasgullas carefully. Don't crowd the pan. The rasgullas are ready now, but careful when taking them out, since they'll be very fluffy and soft and will scar easily. Later it will firm when refrigerated. Place the rasgullas in a bowl, and pour enough syrup just to cover the rasgullas. Let it cool completely then refrigerate, for at least 4 hours before serving. This will help the rasgullas to not only firm but absorb more syrup and flavor from cardamom. – Kneading the paneer is very important, it will make the rasgullas smooth and spongy. – When forming the balls, make sure there are no cracks, otherwise the rasgullas will break when placed in the syrup. – If using a pressure cooker, cook the rasgullas in the syrup for 7 minutes only. – Always rinse the paneer with cold water, it is cheese and warm or hot water will make it melt. – If you want to enjoy the taste of every bite of this dessert, serve at room temperature. These look so unbelievably beautiful! Gorgeous clicks, Muna. How to make white sugar syrup. When i make it become yellow type. And wht is compulsary ingrediant to be add while making balls. I guess it depends on the sugar you use and how much you let it boil, if the syrup boils for long it changes color to pale yellow. These are beautiful! They look like a fancy “ladies” dessert! Thanks for getting the recipe just right for us! well…sounds like gulab jamun…in terms of its texture and problems you come across. i could never get them that pillowy soft texture that i had at indian restaurants…i just dont know …. i might give this a try thought! Gulab Jamun is deep fried, but in texture they’re almost the same, except Rasgullas are more spongy. Hope it comes out right for you! I failed too my dear, no problem it happens 🙂 … But if you followed the tips I wrote I hope it comes out good from the first attempt. Awesome clicks, Muna! 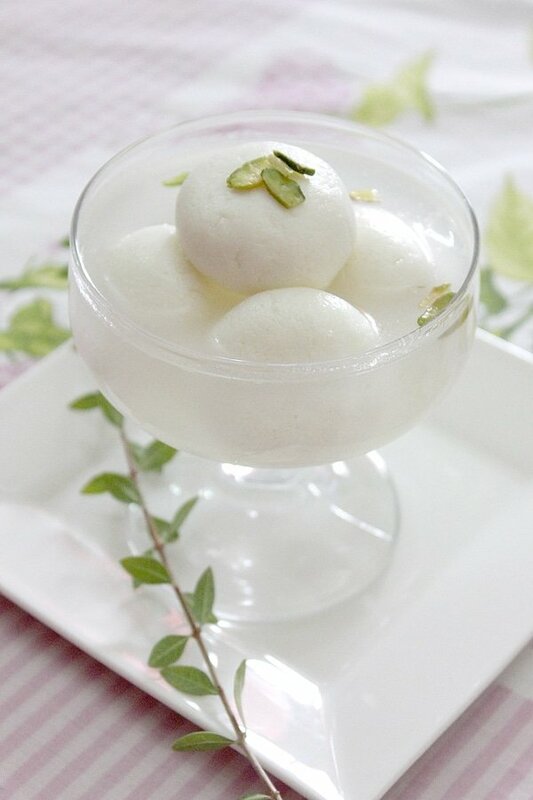 Haven’t heard of rasgullas before…but it sure looks like a very delicious dessert! Hope I can try it someday! I have know or taste any Rasgullas before and I reckon yours looks really good. It looks smooth, silky and beautiful. Gosh, the snowy white colours reminds me of X’mas! 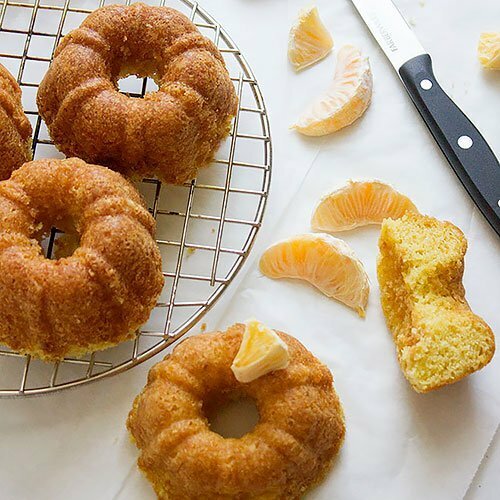 This looks delish, Muna! Hope all’s well with u & it’s great chilling out here again. I’m also following u at Pinterest now! I have never tasted Rasgullas before, and these little white snowy balls looks fluffy, almost like a marshmallow, looks so smooth, silky and creamy in texture. I have always LOVE moichi, and this is something I would love to make for my family to try. I would like to try this…. I always make my own since fresh paneer/ricotta tastes better. I guess you can use the store bought, the key here is to be able to knead the cheese until it feels like smooth dough. Also when forming the balls make sure they are smooth and have no cracks. 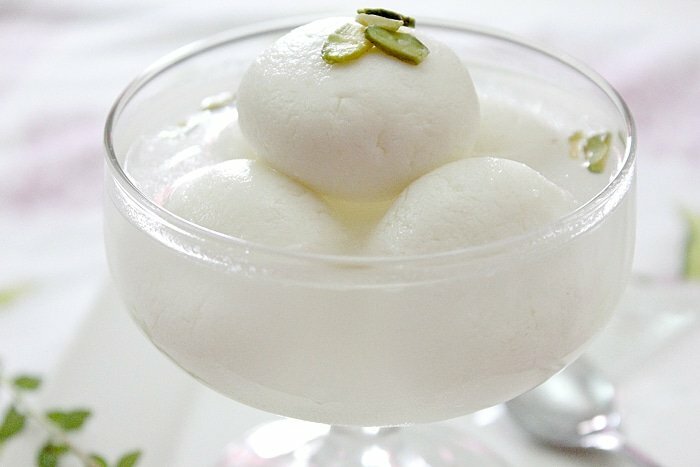 So if you can do this with the store bought ricotta cheese, You’ll be able to make these Rasgullas. One more thing, make sure the ricotta is not salty, and if it was soggy, put it in a cheese cloth and squeeze it. Thank you so much for this delicious recipe and tips. This was my first try and Rasgullas came out perfect and everyone liked it and praised too. 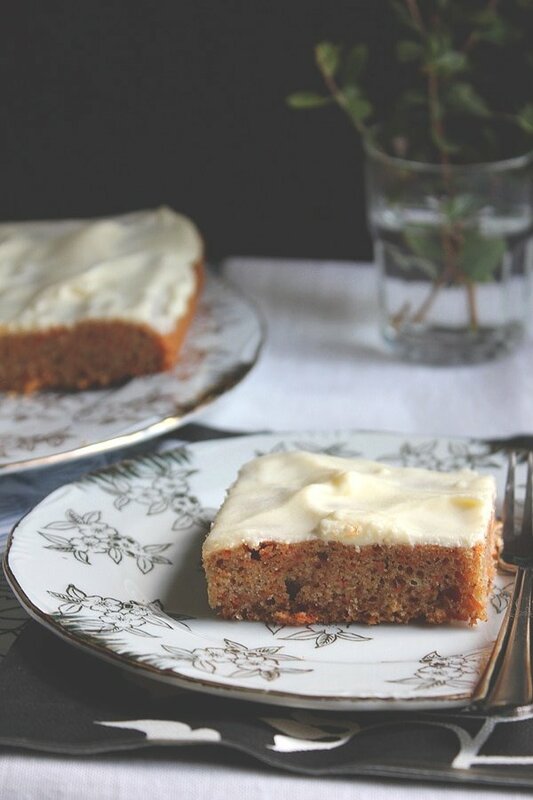 Thank you for taking the trouble to perfect this recipe and blog about it so that the rest of us are inspired to try it out. I had tried to make it before but my rasgullas didn’t puff up much. The taste was fine but the texture… Anyway, I didn’t try again because I thought , why bother? It won’t turn out well, and it’l never match the store bought ones. But you know what inspired me? The gorgeous, mouth-watering picture at the top! I thought what the heck, I’l try again. I did and guess what? They came out beautifully!! Even my picky dad liked it, he said they were better than store bought!! Thanks so much. Second, it needs a high flame, and DO NOT PEEK while its cooking. The pot I used to cook it in had a steam release valve in the handle of the lid (the knob- like thing on top), so it didn’t boil over. I saw another lady’s blog where she said that the high heat is needed to cook the top part at the same time. She said that professional sweet makers added something to make the syrup boil up when they added the balls, so I added the balls when the syrup was boiling, covered the pot, and kept it on high flame. I hope that helps anyone who wants to try this out. aww am craving to eat it…. Thanks for writing, and I’m glad you liked the rasgullas. Sorry they turned hard afterwards, but there are few things that might have contributed to that. 1 – You shouldn’t cook the rasgullas on slow flame but on medium. 2 – You should knead the rasgullas for at least 7 minutes, this will keep it soft. 3 – Since it is winter now, skip the part of refrigerating the rasgullas and keep them out at room temperature. Remember they are made of cheese and cheese gets hard in cold weather. 4 – The syrup in this recipe is not suppose to be thick, so don’t worry you didn’t do anything wrong. In the market they prepare thick syrup on the side and place the rasgullas in it to make it extra sweet. Please also read a comment from SAMEEHA you’ll find her comment above, it has few tips that will help you make these rasgullas perfect. Hi, my rasgullas did not expand. Where did I go wrong? Hi, I have noticed that when using store bought paneer this happens, so the paneer used should be homemade for best results. The other reason is not kneading enough. The more you knead the softer the texture will be and this allows the heat to distribute evenly within the balls when are boiled. Also if the water wasn’t hot enough the rasgullas won’t expand. Last reason is crowding the pan with rasgullas when boiling and not covering the pan. What is the best temperature for storage rasgula. What is the temperature of coldstore when we take rasgula in it. It’s best to store the Rasgullas in an air tight container and Keep it in the least cold area in the fridge. 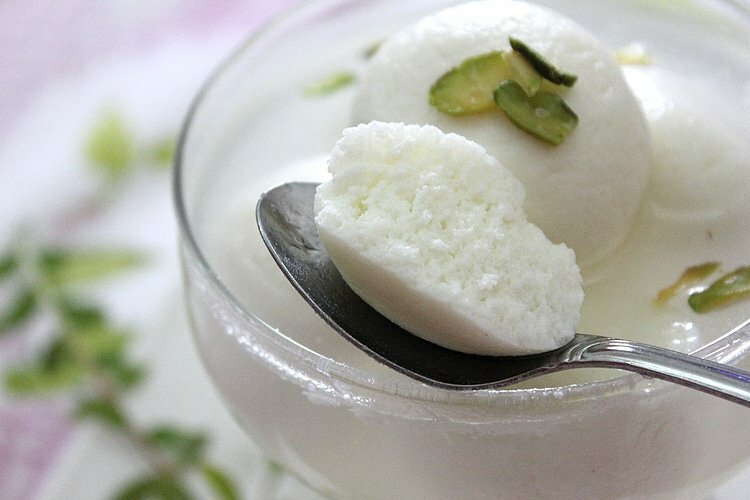 Keep in mind that Rasgullas are actually cheese, so when you serve them, make sure to take them out of the fridge a while before. I make ragullas all the time but they don’t expand enough. can u please tell me why?